iKanji is the number one way to easily browse, search and study kanji on your Mac. Now redesigned to be easier to use and with a powerful new spaced repetition training system. 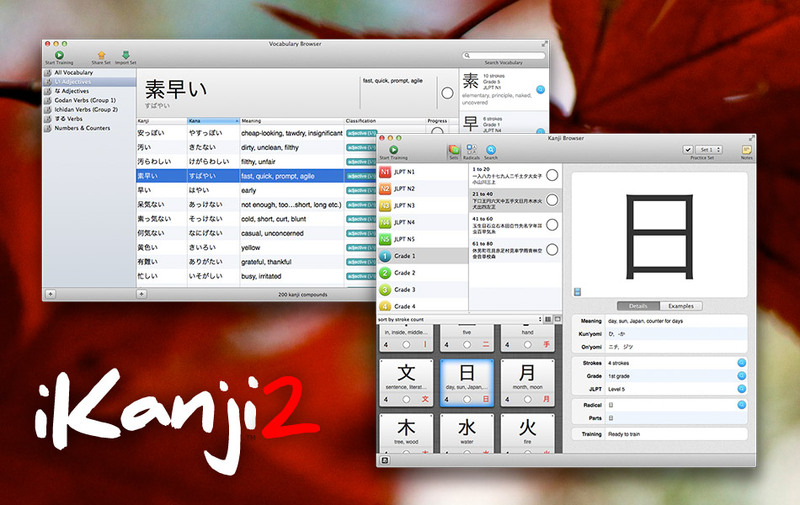 iKanji 2 makes browsing easier by dividing kanji up into sets and subgroups. Sets are provided for each JLPT level* and Japanese school grade. Because these systems don’t always fit in with the way we learn kanji, you can also create up to five practice sets of your own. * iKanji uses unofficial JLPT kanji listings. iKanji 2 now lets you search by selecting radicals, the elements that make up each kanji. This is great for quickly identifying kanji where you don’t know the meaning or readings. You can also perform searches based on almost every attribute of a kanji. Want to find all kanji taught in grade 6 which contain 5 strokes? Simple. How about every jōyō kanji that contains the radical 木? Easy. Learning kanji on their own can be difficult, so why not study them in the context of words? iKanji 2 features a vocabulary browser that lets you search for words and build up sets to practice. Easily share word lists with friends or fellow students, add your own words and organise them into groups using drag and drop. The vocab browser gives you a breakdown of the kanji in a word, which often helps shed light on its meaning. You can find out even more about each kanji at the click of a button. A major reason to upgrade to iKanji 2 is the new kanji and vocabulary training system that works using spaced repetition. Spaced repetition is a proven system for learning that helps you focus on the kanji and vocabulary you may be finding difficult without bogging you down on those you know well. iKanji 2 uses a simple visual indicator to show you how well you know a given kanji or piece of vocabulary. The more green you see the better you’re doing. iKanji 2 features stroke animations for all jōyō kanji and now also colours strokes progressively more brightly as it draws them to make the order clearer. iKanji 2 requires Mac OS X 10.7 (Lion) or later. It will run in demo mode until you purchase a license. While in demo mode iKanji will only run for 10 minutes at a time. Note: iKanji 2 is a paid upgrade for iKanji 1.x users. Need to learn kana too? iKanji 2 is designed for people who already understand hiragana and katakana, if you don’t know these yet or want to improve your skills using them check out iKana. You can buy both products as a bundle with a discount from our store. iKanji is also available for the iPhone and iPod touch! Find out more about iKanji touch.